We’re back in the swing of school, plus my entire family is in our local production of The Wizard of Oz this week, which means that mealtime is short and precious and I need all the planning and recipe ideas I can get! Today I’m sharing 10 of our best, easiest breakfasts. Some of them you can make the day or night before and some of them come together in jut a few minutes, but all of them are definitely do-able on busy weekday mornings (or to make ahead the day or night before)! 1. Overnight Refrigerator Oatmeal. This is a great one to grab on the go in the morning because it doesn’t have to be reheated (although you can if you want). If you’re super efficient, keep the almonds handy and you can just sprinkle them on right before eating! 3. Lemon Poppyseed Scones. These scones are one of my all-time favorites and they’re perfect to grab and go in the morning or to tuck into lunch boxes! 4. Mini Puffed Oven Pancakes with Berry Sauce. These pancakes were always our go-to special breakfast when I was growing up and now that I’m a mom, I realize it’s probably because they’re so easy! You can do them in a big 9×13″ pan, but there’s something fun about making them in muffin tins and having self-contained individual servings. 6. Bacon Egg and Cheese Waffle Bites. These have become a staple at our house, not just for breakfast, but for easy dinners as well! 7. Overnight Apple-Cinnamon Oatmeal. If you love having a hot breakfast, this one’s for you. Your house will smell like apple pie in the morning, which is pretty much the best way to start any day. 8. Oven-Baked Hard-Boiled Eggs. This is my favorite way to make perfect hard-cooked eggs every single time! My daughter loves to eat these for breakfast and lunch and I’ll often pull one out and make an egg salad sandwich for lunch. 9. Homemade Granola with Cherries, Dark Chocolate, and Pistachios. Sprinkle this delicious granola over Greek yogurt for a crunchy, protein-packed breakfast. 10. Ham and Cheddar Waffle Bread. Those are pretty much 4 of my favorite words in the English language. Savory waffles. Top ’em off with a fried egg and that’s the breakfast of champions. 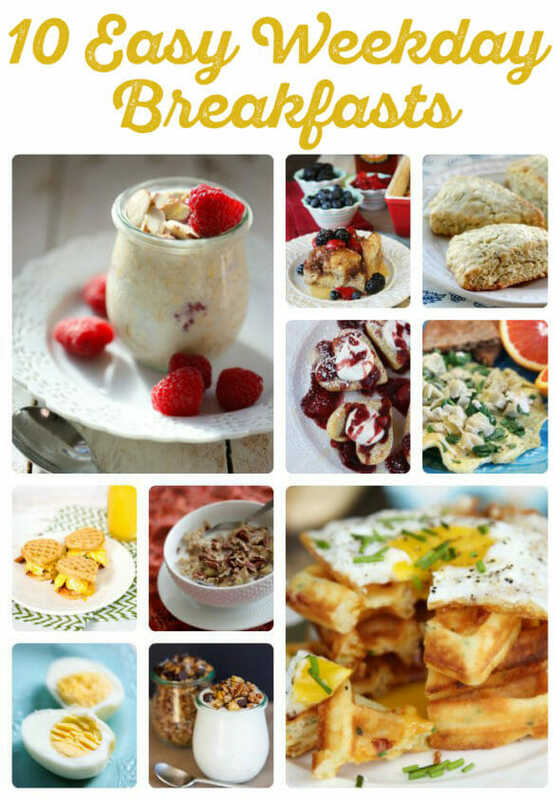 Be sure to check out our entire breakfast section–there were so many amazing recipes that I didn’t include that you might have forgotten about! Thank you! My kids start school today too and I was just telling my husband last night that my least favorite part of school mornings is figuring out what to make for breakfast that is quick and will keep them full until lunch. This post is awesome! We’re always looking for good breakfast ideas so we’ll definitely be pinning this for later! So glad you posted this today because there was this one time I was at the store and they had a really great sale on steel cut oats and I bought a whole bunch remembering that I saw a recipe on your sight that looked amazing and used steel cut oats, but then I couldn’t remember or find that recipe for FOREVER. Fastforward several months to today and voila! It’s your overnight apple cinnamon oatmeal! variety breakfasts when school starts. This is great! It reminds me of all those recipes that I need to try. That French toast is calling my name. I can never have enough easy breakfast ideas, thanks for this great list to help make workday mornings easy to manage 🙂 That Spinach Artichoke Omelet is calling to me! Those scones look amazing! I need them in my life! Thank you for sharing! I often skip breakfast because I don’t know what to eat. This breakfast plan will help me much.